The Panama-bound oil tanker, the Sanchi, was carrying 136,000 tons of condensate, a lighter version of crude oil, when it crashed with a bulk carrier destined for Hong Kong around 160 miles off the coast of Shanghai. However, extreme conditions including strong winds, high waves, and toxic gases are complicating the efforts of dozens of rescue boats attempting to distinguish the fire and locate the 31 missing crew members. “The Chinese government attaches great importance to the accident,” said Chinese Foreign Ministry spokesperson Geng Shuang. The incident has also sparked fears of oil contamination, although the Chinese government has said it has not found evidence of a “large-scale” oil contamination and claimed that unlike crude oil, the condensate is quickly evaporating due to its lightness. However, fears still remain that the oil tanker could explode at any moment due to the high volatility of the condensate oil, likely killing all the crew members on board. 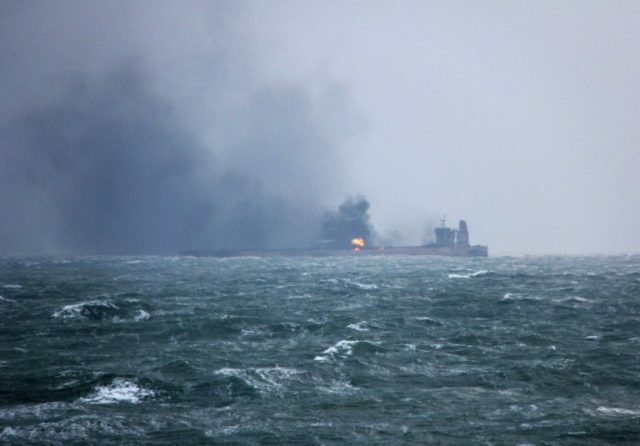 Satellite footage of the ship indicates that the strength of the blaze has decreased since the collision on Saturday, although strong winds have already pushed it 50 kilometers further from the Chinese coastline. On Tuesday, Iranian authorities sent a delegation from the state-run National Iranian Tanker Company (NITC) to discuss the incident and its root causes, as well as future prevention strategies. Environmental protection has become an increasingly important issue for Chinese authorities in recent years, despite China being one of the most polluted countries in the world.